The Senate is currently deadlocked on taking action to prevent the interest on new Stafford guaranteed student loans from rising on July 1 from 3.4% to 6.8%, with Democrats saying they want to "pay for" keeping the current "lower" 3.4% rate by closing a loophole that allows some wealthy people to avoid paying Social Security and Medicare taxes, while Republicans want to "pay for" keeping the lower rate by eliminating a fund for preventative health care in the 2010 health care reform law. But what is all this nonsense about "paying for" a supposedly "lower" interest rate of 3.4%? There are actually two kinds of Stafford loans: subsidized and unsubsidized. The unsubsidized loans, and Stafford loans taken out by graduate students, already carry a whopping -- some might say usurious -- 6.8% interest rate. It's only the so-called "subsidized" loans that carry a 3.4% rate, and it's only those loans that would see their rate rise if the two parties cannot come to an agreement to extend the "subsidy." But what subsidy are they talking about, anyhow? Inflation, according to the government's own statistics, is running at 2.7%. In other words, the government, which is the lender in the case of Stafford Loans, is already making 0.7% on its "subsidized" loans to undergraduates. And the inflation rate has been considerably lower in prior years, so the government has actually been making out like a bandit longer term. If it were to start earning 6.8% on these loans, like it's already making on older loans, unsubsudized Stafford loans and Perkins Loans, the Treasury would be raking in huge profits on a loan program which is supposed to be helping make college affordable for lower income and middle-income students. 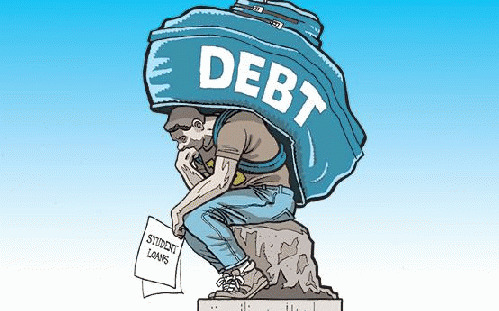 Remember, unless the government secretly suspects that the Occupy Student Loans movement is going to succeed in convincing millions of students to simply refuse to make payments on the $1 trillion in outstanding student loans, these loans are about the safest financial instruments known to man.